Hard to believe, but National Poetry Month is upon us already – welcome to April! Amy Ludwig VanDerwater gets Poetry Friday rolling for this momentous month by hosting today at her blog, The Poem Farm, so be sure to visit for all the links and high jinks! Click to see the final two poems! First up: In case you have not been following my blog this month (ha ha, of COURSE you’ve been following the blog, I’m kidding!) the #MMPoetry 2015 tournament FINALS just wrapped up at Ed DeCaria’s Think, Kid, Think. Buffy Silverman and Randi Sonenshine were the only two authletes remaining, and each was tasked with writing a children’s poem utilizing the words they were given: “gargoyles” and “catatonic,” respectively. It was a tight race, but my Poet’s Garage critique partner ended up victorious – so congratulations, Buffy! Had I the money – I would have bought a toy. Had I a toy – I might have had some fun. Had I some fun – I’d be a happy boy. Alas, of all these things, I have not one. with my allowance waiting, on my bed. ALSO: Irene Latham’s annual Progressive Poem got underway this past Wednesday, April 1! Each day, a different person adds their line to a poem that grows and grows over the course of the month…until it culminates April 30 with the final, closing line. I’m excited – and a bit anxious – about the fact that I’ll be capping off the poem on that date! Poetry Friday Anthology for Celebrations: my contribution! The last couple of weeks, I’ve been sharing some poems I wrote that didn’t make it into the newly-released Poetry Friday Anthology for Celebrations (Pomelo Books). Today, I’m sharing the poem that DID make it in! The latest in the Poetry Friday Anthology series just came out on March 14 (Super Pi Day!) and I’m so happy to be a part of it. Published in two versions (a student edition with illustrations and a teacher’s edition with additional information on poetry and lesson planning), the book is comprised of 156 poems in English with a Spanish translation for each poem. That’s a lot of poetry in one book! Be sure to “check out” the complete Poetry Friday roundup at Ms. Mac’s place, Check It Out! Also, please “check out” the #MMPoetry 2015 tournament that is coming down to the wire at Ed DeCaria’s Think, Kid, Think – only FOUR authletes remain, and Yours Truly is not feeling very happy about having to vote for two of his four friends and not for the other two! Now, if you don’t mind, there are still a couple of puddles outside that need jumping-into…have a great weekend! National Poetry Month continues, and there’s so much going on in the Kidlitosphere it’s hard to keep track of it all. Blog posts come and blog posts go, and I try to read as many as I can…but there’s just no way I can get to all of them. One post I’m glad I didn’t miss helped me write today’s poem. Earlier this week at The Miss Rumphius Effect, former National Children’s Poet Laureate J. Patrick Lewis shared a new poetic form he calls the “homophoem,” a poem designed with homophones in mind. (If you don’t know what a homophone is. it’s two or more words that share the same sound, like ate and eight or carrot and carat) The concept is that the last word in the poem is a homophone which acts as the ‘twist’ of the poem. Give me just a clue! But wait, there’s more! Michelle Heindenrich Barnes is celebrating her blog’s FIRST birthday by hosting Poetry Friday today at Today’s Little Ditty, so head on over to get all the links and info – and maybe some cake and ice cream before it’s gone! Have you been following Irene Latham’s 2014 Progressive Poem? As I’ve mentioned in previous posts, a different poet adds a line to the poem each day, and by the end of April we’ll have a complete, crowd-sourced poem! This past Tuesday, I added my line, and today the poem heads to Linda Kulp at Write Time. You can follow along by checking in with each of the contributors, listed below! #MMPoetry – we have a winner! If you haven’t checked out all the children’s poems that have been produced in just the past couple weeks, you can still log on and see all the incredible poetry that has been created this month. Just last night, the polls closed on the final matchup between J.J. Close and Samuel “The Lunchbox Doodler” Kent – and congratulations to Samuel for winning the tournament! Click the graphic and you can read both poems! 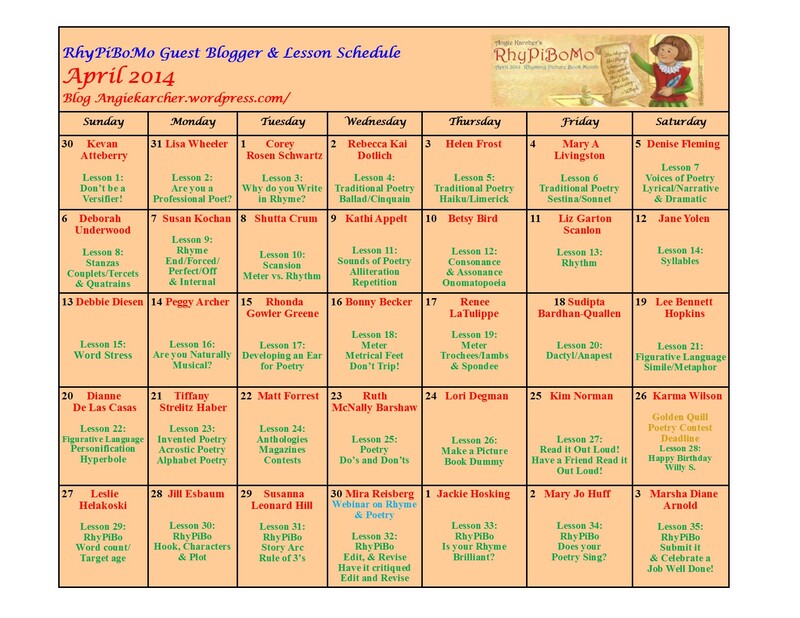 I’m very happy to be part of Angie Karcher’s RhyPiBoMo event this month (Rhyming Picture Book Month). All month, she’s encouraging writers to create rhyming picture books (and she’s assembled a team so large and decorated, I have no idea what I’m doing amongst them!) I’ll be guest blogging on April 26, discussing the benefits of collaboration – so please be sure to join me then! I interviewed Gerald last year as part of my National Poetry Month celebration, and I thought it might be nice to check in with him a year later to see how things have been progressing. You may not think crime and poetry have much to do with each other…but read a few of the poems that Gerald has published on his site as well as in one of his eBooks, and you just might change your mind. I’m also honored that Gerald has chosen a poem of mine to publish in May, so I’ll be sure to share that link once it is posted! National Poetry Month: The 2014 Progressive Poem! As a blogger and children’s writer, it’s hard to celebrate National Poetry Month while laid up recuperating from ACL reconstruction. One might think that I have all the time in the world, since I can’t really do anything – but the fact of the matter is, the 4-year-old and 7-month-old take up almost ALL my time. I’ve only just begun to feel comfortable enough sitting at my desk to be able to work, so running and managing the nuts and bolts of my voiceover business comes before blogging, unfortunately. Hopefully, once I’m off crutches next week and can start walking and exercising and rehabbing, I’ll have more time for the fun stuff. Today, though, is definitely fun! 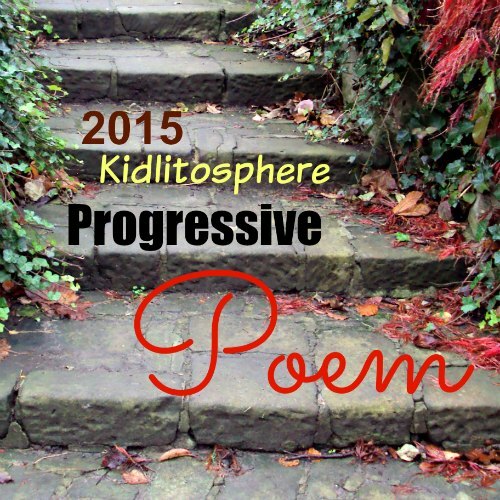 It’s my turn to take part in Irene Latham’s 2014 Progressive Poem! As I’ve mentioned in previous posts, a different poet adds a line to the poem each day, and by the end of April we’ll have a complete poem written by 30 different people. Talk about crowd-sourcing! If I recall correctly, I think this is the first year the poem has rhymed – which makes for a tougher assignment, of course. A writer should want to maintain the integrity of the poem without falling into a singsong kind of rhythm or letting the rhyme take over the mood or emotion of the poem itself. Hopefully I fulfilled my duty. I’m looking forward to seeing where this goes – you can follow along, too, by checking in with each of the contributors, listed below! Best wishes to Diane Mayr, who will add her line tomorrow! If you haven’t checked out all the children’s poems that have been produced in just the past couple weeks, you can still log on and see all the incredible poetry that has been created this month. Just last night, the polls closed on the final matchup between J.J. Close and Samuel “The Lunchbox Doodler” Kent – and congratulations to Samuel for winning the tournament! Click the graphic and you can read both poems! For all of today’s Poetry Friday links, visit Amy at The Poem Farm, where she has all the info and a baseball poem – and be sure to stop by each of the 2014 Kidlitosphere Progressive Poem Contributors (below) and see how the poem…progresses! #MMPoetry – we’re down to the Finals! If you haven’t checked out all the children’s poems that have been produced in just the past couple weeks, make sure you log on and vote for your favourites – by the time the dust settles, only one authlete will be left standing! By now you probably know at least a little bit about this year’s #MMPoetry2014 competition, of which I am again a part. Each year, Ed DeCaria at Think Kid, Think! hosts a bracketed poetry competition similar to that famous college basketball tournament in March, featuring 64 “authletes” competing against one another. Each of us is given a word (mine is “appendage”), and then we have 36 hours to craft a children’s poem using that word. Whoever wins their round moves to the next bracket, and so on, until we have one clear and decisive victor! is sour and sad on the tongue. It didn’t win, so I wasn’t able to move on, but I still like it. Probably skews to a bit older crowd. Nevertheless, I’m proud of it, so I hope you’ll cheer on all the folks who are competing this year! Click that link above and let your opinions be counted! And for all of today’s Poetry Friday happenings, please visit Julie Larios at The Drift Record. The following was posted this past Tue., but voting is now underway! You can find the poll HERE! The poll for this particular match-up between me and Buffy closes shortly after 9:30pm EDST, so please click the link and vote for your favourite! Click the logo to vote! I just wanted to send a quick post about this year’s MMPoetry2014 competition, of which I am again a part. Each year, Ed DeCaria at Think Kid, Think! hosts a bracketed poetry competition similar to that famous March college basketball tournament which is full of Madness, but which we can’t speak of by name due to potential infringement of a registered trademark. OK, so anyway…I submitted my First Round poem last night (along with 32 other ‘authletes,’ as we’re called) and voting is set to begin sometime after 9am Central Daylight Time (US). Voting for the other 32 authletes (there’s a total of 64 of of us) will follow. Each of us is given a word (mine is “appendage”), and then we have 36 hours to craft a children’s poem using that word. I’ll be sure to post the link to the voting page I’m sharing with the esteemed Buffy Silverman, my fellow Poet’s Garage member who has written poems for Ladybug, Spider, Cricket, Highlights for Children, and Know magazines. The number of magazines I’ve had children’s poems published in: uhh…zero. This might be a quick competition. Nevertheless, it’s a lot of fun, so be sure to check back here or follow me on Facebook and Twitter to get updates and links – and get ready to vote for your favourites! Let me just say, this recovery thing is certainly taking longer than I’d anticipated. In case you’re unaware, I tore every ligament in my right knee that I possibly could while playing indoor soccer the Tuesday before Thanksgiving – which is why I’ve been on hiatus for awhile. Between taking care of a 4-year-old and a 5-month-old, running my voiceover business, and trying to keep the house from looking like something worthy of a reality-TV makeover…I just had no time at all to maintain the blog. I still have no time – but since I can at least walk a little better and finally bend my knee at an almost 90-degree angle, I’m going to see what happens! Truth is, I don’t know what I’ll do in March, when I hope to have surgery, but we’ll cross that bridge when we get to it. For now, I’m planning on posting something new at least once per week and possibly twice per week; however, the schedule will not be the same. I used to post every Tuesday and Friday, but for now, I’ll post when my schedule allows me to. Being a parent and hubby and fully recovering from the injury are my priorities – followed closely by running my business as a voice talent. As my time opens up, hopefully I’ll be able to do more. I’m going to have to recover quickly, actually! I have an interview with children’s poet/author David L. Harrison planned for next week, I have Poetry Friday posts I’m looking forward to, I’m in the middle of judging the CYBILS Award for Poetry along with some other fine folks, I’ll be posting an advance review of Laura Purdie Salas’ new book, Water Can Be (Millbrook) due out April 1, I’ll be taking part in Angie Karcher’s RhyPiBoMo (Rhyming Picture Book Month) celebration, AND I’ll be again teaming up with Gerald So at the The 5-2 : Crime Poetry Weekly when April rolls around for National Poetry Month. On top of all this, I hope to once again be able to compete in Ed DeCaria’s #MMPoetry Challenge 2014 at his blog, Think, Kid, Think! In the meantime, please visit my friend and fellow writer Michelle Heidenrich Barnes’s blog, Today’s Little Ditty , as she is spotlighting a haiku by Yours Truly today! Thanks for visiting, and I hope to talk to you more in the weeks ahead. Did you like this post? Find something interesting elsewhere in this blog? I really won’t mind at all if you feel compelled to share it! To keep abreast of all my posts, please consider subscribing via the links up there on the right! (I usually only post twice a week – on Tues. and Fri. – so you won’t be inundated with emails every day) Also feel free to visit my voiceover website HERE, and you can also follow me via Twitter , Facebook, Pinterest, and SoundCloud! Poetry Friday: #MMPoetry is underway! Rather than read today’s poem here, I’m kindly requesting that you head over to the #MMPoetry competition hosted by Ed DeCaria at Think, Kid Think! to read it there. Why? Because the March Madness Poetry (#MMPoetry) competition just got underway this week, and all the participants would love for you to see what’s going on! 64 competitors from around the globe (Yours Truly included) have been given words ranked according to their difficulty and are charged with creating children’s poems using those words. We each had only 36 hours to create a children’s poem using our word. You can read both of our poems HERE and vote for your favourite! You can also search the scoreboard (or click HERE) and see all the other poems written for this tournament and vote on those, as well. Some of the words are ridiculously hard, too – like meretricious, flaccid, and anthropomorphication. Yes, you read that correctly. Some poor souls had to put those words in children’s poems. And they all did a marvelous job, too! One caveat, though: the polls close at around 9:40pm – that’s tonight, Fri. March 15! After that, the poems will still be available to read, but you won’t be able to vote on them. Whoever wins move on to the Second round! And once you finish reading those 64 poems…if you still crave even MORE poetry… Jone MacCulloch at Check it Out has even more, as today’s Poetry Friday hostess!